You can select any of the available options in the Color Correction window to customize the image colors for your print job. Lets you select a Color Mode setting, individual settings for Brightness, Contrast, Saturation, and Density, and individual color tones. Depending on the selected color mode, you can also adjust the midtone density using the Gamma setting. Improves the color, contrast, and sharpness of flawed photos. Note: Fix Photo uses a sophisticated face recognition technology to optimize photos that include faces. For this to work, both eyes and the nose must be visible in the subject's face. If your photo includes a face with an intentional color cast, such as a statue, you may want to turn off Fix Photo to retain the special color effects. 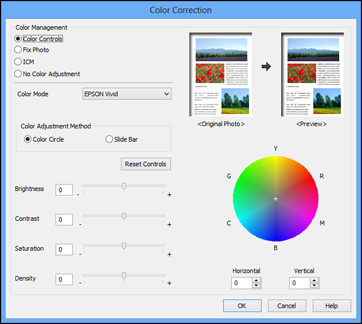 Turns off color management in your printer software so you can manage color using only your application software.